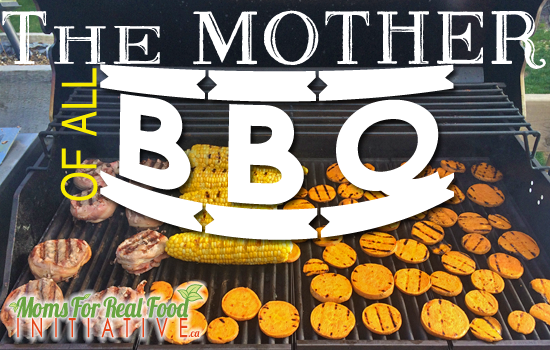 The Mother of all BBQ – Moms, For Real. Canadian Mom Bloggers. Real Healthy Living. It’s the end of summer. It’s stupid hot out and that leads to one of 3 things in this house smoothies, salads or BBQ everything. Here is my fast take on grilling up some fabulous food. Before you fire up the BBQ put a little olive oil on a paper towel and rub it all over your grill. It stops everything from sticking and puts perfect grill marks on your food. Now fire it up. Our grill has a thermometer at the base of the lid, on each grill, so it’s a more accurate temperature reading on what the grill temperature actually is. Get your grill really hot. 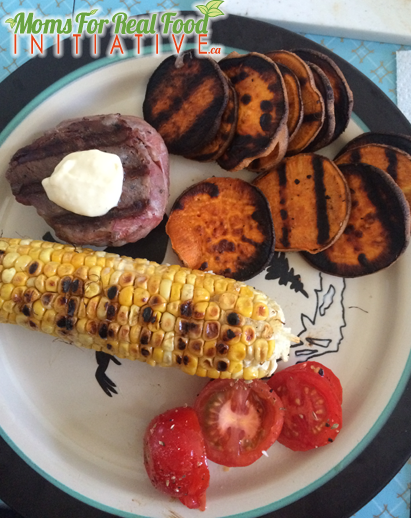 Turn down the temp once you put your food on the grill or you’ll end up with raw in the middle burnt hockey pucks. Veggies- Well now this opens a whole weird and crazy world of grilling awesomeness! Our current favourite is sweet potato medallions tossed in olive oil sprinkled with a little salt and pepper. We were at the end of our Kohut Corn we picked last fall so it was already shucked. You can grill pretty much everything. We have cut heads of romaine lettuce in half oiled it and slapped it on the grill and it was AMAZING. Seriously try it! I’m a sucker for fresh veggies so I usually have some raw, freshness to top off the meal. Tomatoes drizzled with olive oil sprinkled with a little salt and pepper is perfect. Tips: Keep your flavours simple. Always use condiments. Horseradish Aioli is amazing on steak and easy to make. Kick it up and try something new.